love the sound barrier being broken sound why go to space other then just flying right to the other city? You could adjust ambient light when you get closer to ground - the ship seems to be lighted the same as in space, with dark crisp shadows, wich does not look good, for me at least. The cockpit model - not the interface, but surrounding model looks very simple, i think it should have its personal detailed model, separated from ship, dont you think ? Very nice video / game. Congratulations on the earth/space transition (dynamic mesh generation) I know how its complicated (I'm currently doing a procedural terrain generation). Also the view of the earth atmosphere at the far horizon (at space) is amazing. But one thing got me, why do you need to "land" a space ship like an air plane?? You have thrusters on all sides and also "limitless" fuel, don't need to worry with aerodynamics to not fall on groung its not the air that maintain the ship flying. I know that the land/take off mechanics if very nice to perform, but ... its not an air plane simulator. In this video we are going to travel from city to city flying over 100 km from the ground. This is called Suborbital Spaceflight and allows to reach much higher speeds than a traditional planetary flight because there is less or no atmospheric drag. We are also going to see a typical Atmospheric Re-Entry done with the help of the Reverse Thrusters. 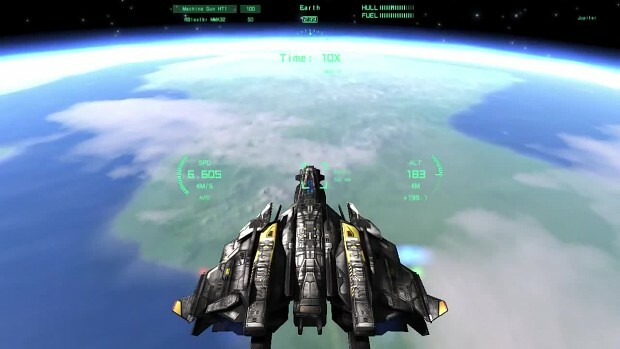 Nova Voyager™ is an upcoming indie Space Combat Flight Simulator with full size Procedural Planetary Scale Rendering. Nova Voyager will also have Seamless Space to Planet Surface Transfers, Seamless Interstellar Travels and Realistic Physics.